Temple Normanton grid merges with the Chatsworth House grid so much so a joint article was required to see how complimentary it all is........cream on the cake was the 345 triangle linking Chatsworth House , Hardwick Hall and the SW penta leg point at Matlock. The 4 value side becomes the central axis of the Temple Normanton penta. 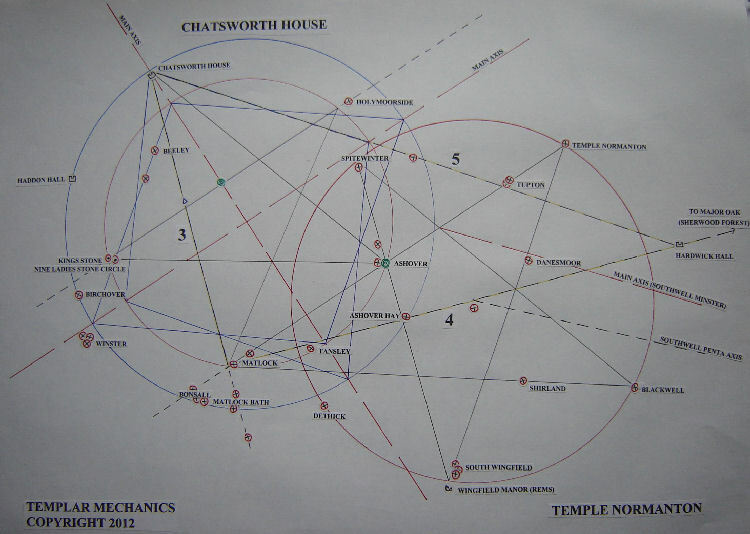 The 5 value side linking Hardwick Hall with Chatsworth House actually travels with the 51.51 blue earth moon pyramid line which runs off the main axis of the red earth circle...which has nine ladies stone circle on its circumference along with the ‘Kings Stone’. More to follow with pics after the field trip and the historical importance of major points looked into.